The fun never ceases. 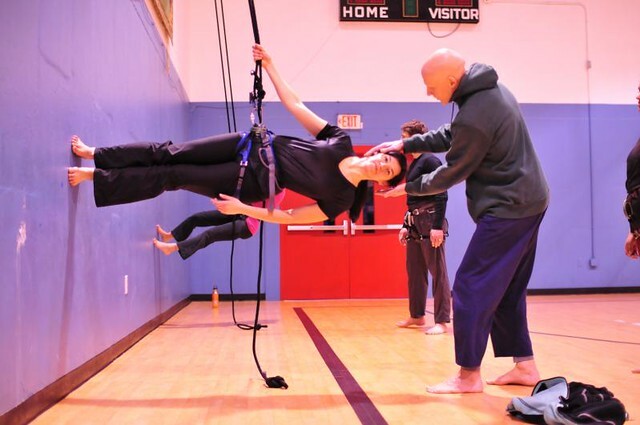 Yesterday, dancer Tara Brandel of the Croi Glan Integrated Dance Company of Cork, Ireland, taught a beginners workshop for wall running to members of Madison's own Cycropia Aerial Dance troupe. 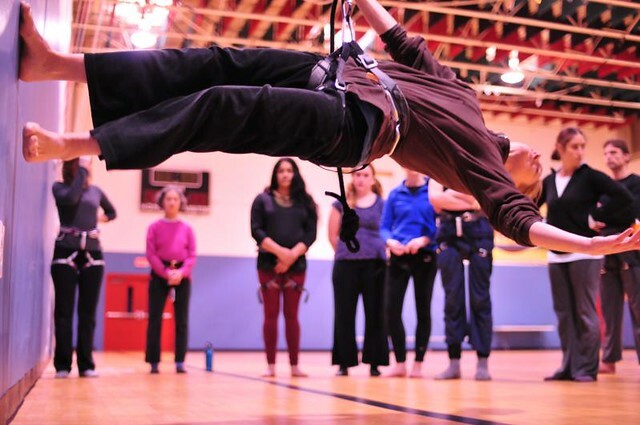 The workshop covered an introduction to wall running, a form of aerial dance most notably performed by Bandaloop Project (sample video). A few of the dancers had tried it at least once or twice, but there was no real familiarity with the form. Everything was hard. Posture is the first thing to master, and it is not simple. The dancers are wearing a rock-climbing harness and clipped in to a rig that includes a grigri climbing device which allows them to control their height on the wall. 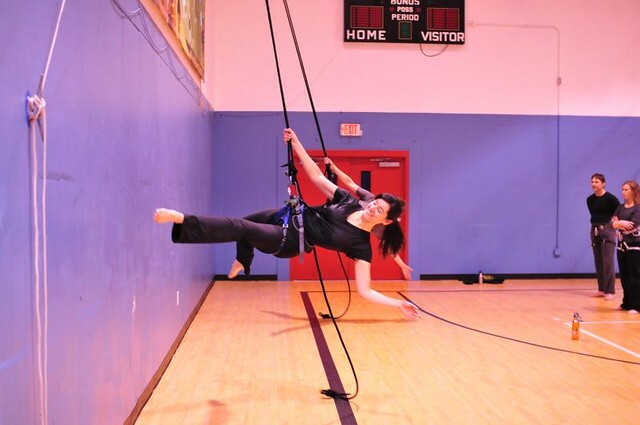 The rope is attached to the gym ceiling 22' up and about a foot from the wall. So "standing", sideways, requires the dancer to hold herself straight which requires a lot of core muscle. The body wants to fold forward at the waist/harness, so to compensate for this the dancer continuously pushes forward with the pelvis, arches a bit back with the chest, and pulls the thighs together. That is what it takes to stand still. Those of us who have some experience assisted with these basics as we had four dancers on the wall at a time. Eventually everyone got a turn at standing, then running. 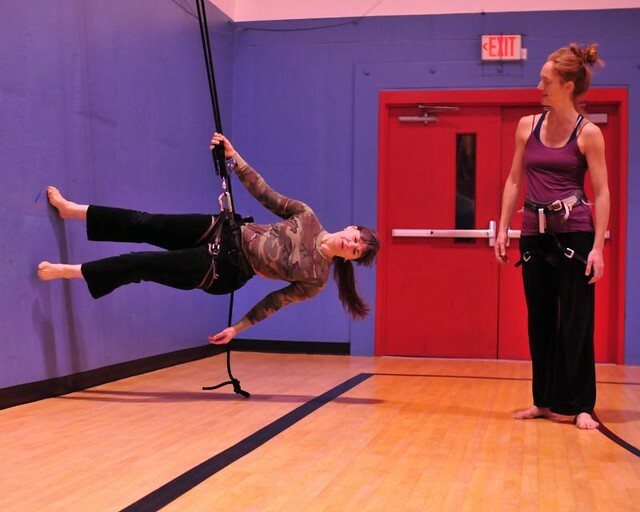 The rope acts as a pendulum so the dancer defines an arc on the wall. Once the basics of running are established, turns are introduced along with other (eventually) elegant dance moves. By the end of the workshop pretty much everyone was able to do a back flip, though we had spotters to help each dancer to prevent rude crashes into the concrete wall. Everyone had fun, and Cycropia benefits by having another dozen people exposed to this new-to-us form. Tonight is the advanced techniques workshop, also by Tara, and I get my turn to play and learn some new moves. I cannot wait! I probably will have some photos, but the camera is secondary tonight. Tonight I fly, and then I dream. There are more photos here in a SLIDE SHOW. These are lovely thanks Nataraj...and I love your clear commentary on the form.